The good old days of the 1970’s and 1980’s eh … with such highlights lowlights as 24% inflation, 17% interest rates, 3 day working week, 13% unemployment, power cuts … those were the days (not)… but at least people could afford to buy their own home. So why aren’t the 20 and 30 something’s buying in the same numbers as they were 30 or 40 years ago? Many people blame the credit crunch and global recession of 2008, which had an enormous impact on the Bedford (and UK) housing market. Predominantly, the 20 something first-time buyers who, confronting a problematic mortgage market, the perceived need for big deposits, reduced job security and declining disposable income, discovered it challenging to assemble the monetary means to get on to the Bedford property ladder. However, I would say there has been something else at play other than the issue of raising a deposit – having sufficient income and rising property prices in Bedford. Whilst these are important factors and barriers to homeownership, I also believe there has been a generational change in attitudes towards home ownership in Bedford (and in fact the rest of the Country). 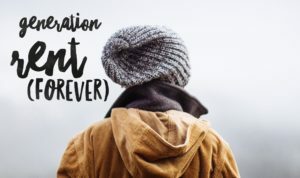 You see, I believe renting is a fundamental part of the housing sector, and a meaningful proportion of the younger adult members of the Bedford population choose to be tenants as it better suits their plans and lifestyle. Local Government in Bedford (including the planners – especially the planners), land owners and landlords need an adaptable Bedford residential property sector that allows the diverse choices of these Bedford 20 and 30 year olds to be met. 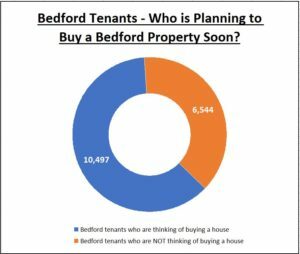 This means, if we applied the same percentages to the current 17,041 Bedford tenants in their 7,202 private rental properties, 6,544 tenants have no plans to ever buy a property – good news for the landlords of those 2,766 properties. Interestingly, in the same report, just under two thirds (62%) of tenants said they didn’t expect to buy within the next year. .. but does that mean the other third will be buying in Bedford in the next 12 months? Some will, but most won’t … in fact, the Royal Institution of Chartered Surveyors (RICS) predicts that, by 2025, that the number of people renting will increase, not drop. Yes, many tenants might hope to buy but the reality is different for the reasons set out above. The RICS predicts the number of tenants looking to rent will increase by 1.8 million households by 2025, as rising house prices continue to make home ownership increasingly unaffordable for younger generations. So, if we applied this rise to Bedford, we will in fact need an additional 3,087 private rental properties over the next eight years (or 386 a year) … meaning the number of private rented properties in Bedford is projected to rise to an eye watering 10,289 households.